It all began in 1908 when John Cote and a friend were hired by a neighbor to move a piano. Fifty years later, when William Huff took over the small two-man business, the world was a little bit different. Homeowners needed help moving such modern conveniences as televisions, washers and dryers, and refrigerators. Huff and his brother Clyde spent the next 40 years moving households. Jim L. Henderson bought the well-established family business in 1988. Since then, Henderson has expanded the moving company to serve a greater number of clients all the while maintaining its long-standing traditional values and standards. The combination of our people, equipment and facilities results in a quality, stress-free move for you, your family and your valuables. William C. Huff Companies is proud of our 5 star DEMA rating. 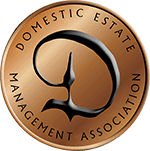 The Domestic Estate Management Association raises the standard of the private service community. Choosing the wrong company to handle your treasures is not an option. At William C. Huff Companies we do not make promises about how good we are, we guarantee it! Your family heirlooms cannot be replaced by money, and we treat every item in your home like a family heirloom. Our professionally trained senior staff each average over ten years of experience in the field, giving you complete peace of mind that every aspect of your move will go flawlessly. We guarantee it. We have been moving prized possessions, family heirlooms, fragile and delicate materials with our tradition of quality for over a century.